Dynamical Biomarkers Group head Dr. Chung-Kang Peng casually mentioned that he and Final Frontier Medical Devices have discussed joining forces when it comes time to bring products to market. Dr. Peng’s team, Dynamical Biomarkers Group, delivered a solution in what looks like a cross between a first aid kit and a fishing tackle box. It’s a well-packaged product, thanks in no small part to the backing of HTC. Not surprisingly, the demo ran off a Butterfly handset, chosen for its light weight, to help the package arrive at just under the five-pound mark. Inside the box are three different modules — a vital sensor, blood/urine strips and a smart scope. The handset is the brains of the system, featuring an initial walk-through in which the patient helps determine the source of the issue. From there, the modules feed information to the phone via Bluetooth — or, in the case of the blood and urine strips, using the on-board camera. Once collected, the information is uploaded to Amazon’s server for analysis, as the phone doesn’t have the on-board processing power to complete the tests. 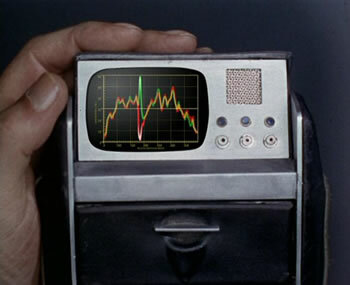 SF fans who watched Star Trek in their teens have turned gray in their wait for Star Trek tricorders; but, if we're patient, we'll see them in our lifetime. Read lots more at Techcrunch.